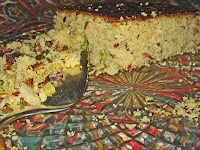 Cornbread Suppers: Campsie Cornbread Suppers: The Recipes! Anita Courtney says: Let's create a Campsie Cornbread Suppers recipe collection. Please send me (anitac@qx.net) any recipes that you’ve brought that you'd like to share and I'll post them on this blog. We'll have our own eco-friendly, local cookbook. If there is a dish you really liked but you don't know who made it, feel free to request it and we'll try to track it down. If you get more than 3 compliments on your dish, you're pretty much required to send it in. Here's to more connection, crunch and comfort on Campsie.